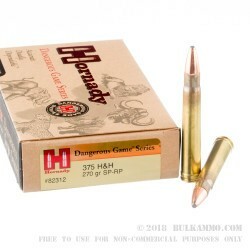 This 375 H&H Mag cartridge from Hornady’s Dangerous Game series of ammunition sports a 270 grain spire point - recoil proof (SP-RP) projectile. 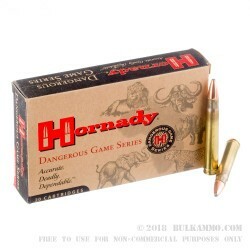 The bullet is specifically designed to eliminate the issue of tip deformation during recoil, so you can expect it to work marvelously even in so powerful a rifle. As an InterLock, this bullet features inner grooves which strategically weaken the upper portion of its tapered jacket to ensure consistent and controlled expansion, even at lower velocities. 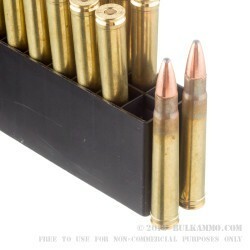 This bullet’s one-piece core retains great mass and energy to provide the deep penetration needed to create a devastating wound channel. 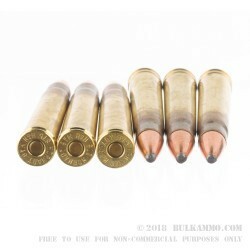 This bullet further offers a cannelure to provide accurate and consistent crimping as well as an InterLock ring embedded in its core, which together ensure its core and jacket remain locked together during expansion. When you’re hunting dangerous game, whether it’s the wily lion, the tenacious Cape buffalo, or the bloodthirsty Appalachian cottontail, you can count on this round to take the animal down fast and safely.